In a recent internet exchange it was mentioned that Clapton FC had a reputation for being the ‘Posh, Amateur Club. Whilst confident that no members of the Bullingdon Club have actually either played or have been members of the Tons, it is true that the club’s founder W.R. (Reg) Davies was a successful stockbroker. When the club landed the lease on the Spotted Dog Enclosure in 1888 for £35 pa, it was a reasonably ambitious acquisition. The two local teams were Upton Park FC and Woodville FC (now Barking FC) both of whom played in West Ham Park. Both were undoubtedly posh. Upton Park represented the FA on various tours abroad. However Clapton also had some ‘chaps’ among their number and their trip to Belgium in 1890 would certainly been outside the budget of the local ‘oy polloy’. Another Clapton notable was Stanley Briggs, the Tottenham captain. He joined Clapton because he refused to turn professional. He probably had the private resource to be able to do so. A short time later,, the Clapton team included Walter Tull. Tull was not posh. He was an orphan from Bethnal Green and worked as a printer when he joined Clapton. Teammate Clyde Purnell was one of 10 children and worked as a Commercial Traveller. Clapton also had a supporters association, and the club’s 1934 accounts show that membership subscriptions totalled £47 and five shillings which suggests there were a considerable number of members. They included Ian Simpson’s dad Bert, He wasn’t posh. After the war, with the inevitable large scale displacement of people and communities, the club still managed to attract more local people to join and contribute, both on and off the field. 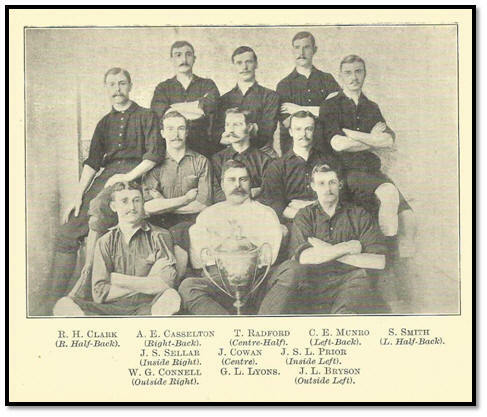 But, as other clubs embraced professionalism, and then sham-amateurism, the standard of the Clapton team, populated by less than posh locals, fell behind some of the other clubs in the Isthmian League which, ironically, was a competition founded on the basis of amateur values and the sufficiency of honour in playing the game. Fortunately, Clapton remained strong off the field, aided by some hard work from the members in keeping the lease alive and facilities up to the mark. It was not until the 1960s that the first pint was pulled in the Clapton clubhouse, and it was a pint of Watney’s Red Barrel. That’s not Pimms, and that’s not Posh. Since then the club has been populated from people from all walks of life and social strata. Clapton has changed with the times as it should. Many football teams, of a similar age to Clapton, also have chaps with bowler hats as part of their history. At some clubs, those chaps have been replaced by financial benefactors and other ‘opportunists’, many of whom, have ultimately led the club to ruin and extinction. I think ‘posh’ Reg Davies would have applauded the Ultras, as he viewed true support for the club as being paramount. One doubts he would be happy with the debacle behind the scenes at Clapton.. That’s not being posh, that’s being principled. Rather than ‘navel gazing’ at a ‘posh past’, perhaps we should acknowledge the history but, more importantly keep looking to the future. Amateur? That’s for another day. Previous Previous post: 126 Years At the Old Spotted Dog !